To be good at anything, you need the right tools – bartending is no different. Without the right bar tools, the quality and taste of your drinks will suffer, your customer service time will increase and ultimately, your tips will decrease (as will sales). Selecting the right bartending supplies when you are just starting out in the business can get a little confusing. It’s sometimes hard to tell exactly what’s needed and what’s for show. 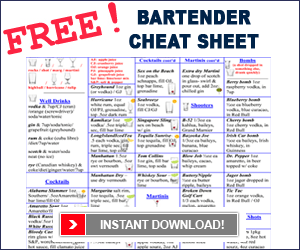 If you’re bartending at an established bar, pub or club, however, you’ll need professional bar tools from the get-go – ones that can stand the abuse that bartending tools go through while on the job. Conversely, if you have a home bar and are just looking for basic bartending tools, you won’t need to focus so much on durability and can pay more attention to aesthetics. So, to get you familiar with the must-have’s of bar tools, we’ve listed a complete set below including its contents and, further down the page, we’ve listed the products one-by-one with a picture and description of the item along with its use. Note that some of the links on this page go to where you can order the product on Amazon and some are through BarProducts. Generally, we recommend buying through Amazon as their review system is a well-oiled machine, ensuring that if you order a highly rated product, you’re going to receive a quality bar tool shipped to your door. If we couldn’t find a particular product on Amazon or isn’t highly rated – such as the professional bartending kit pictured below – then we recommend buying through our partners at BarProducts. If you’re looking for a home bar set-up or if you’re looking to stock your pub, club or lounge with the best bartending tools available, here they are – all in one convenient package. 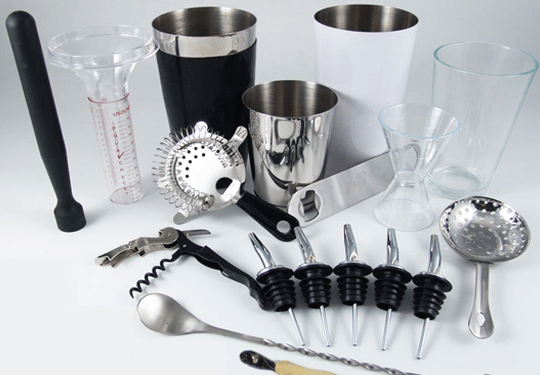 The Premium Bartending Kit is all any bar, bartender or home enthusiast needs for a fully functioning bar. If you are just starting out in bartending, just bought a new bar, need to replace old bar tools or if you’re just wanting to fully stock that bar you have (or plan to make) at your place, the Premium Bartending Kit is your best option. Bar Towels – If you’ve been in a bar before, on either side of the bar, you know they get messy. And if you don’t have a bar towel on hand, you’ll be cursing your dirty hands, the sticky bar top and your filthy tips at the end of the night. As McDonald’s tells you “if there’s time to lean, there’s time to clean!”. Make sure you always have bar towels on hand to keep your station, behind the bar and the bar top clean at all times. You should also have another dry bar towel on hand to polish glasses out of the glass washer. Metal Pour Spouts – Like their plastic cousins, they make pouring alcohol a breeze. And with these metal pour spouts, using a counting system while pouring (as in the 1-1000, 2-1000, 3-1000 pour) just got a whole lot easier and more accurate. Juice Containers / Bar Mix Pourers – For speed, look, freshness and taste, these juice pourers are fantastic. Less used juices such as pineapple or grapefruit can’t be left in large cans after opening for extended periods of time and running back and forth to the bar fridge for juice and mix every order isn’t making anyone money. Fill these containers with your most widely used mixes and increase your bartender’s service time. To store after each shift, unscrew the top, place cellophane wrap over the opening and screw the top back on (the Premium Bartending Kit comes with extra storage containers). Plastic Pour Spouts – If you’ve been behind the bar before, then you know how much easier and more accurate it is to pour from bottles with pour spouts on them. Sometimes, the added expense of putting pour spouts on every bottle deters bar owners from doing so. That really shouldn’t be a problem with the solid black plastic pour spouts which sell for $8.20 for 2 dozen. Cocktail Shaker Tin – Many cocktails and martinis require the ingredients to be mixed together beforehand or to be strained or shaken on ice. For all this and more, the shaker tin is at your service. Short Shaker (Cheater Tin) – The 16oz Shaker, also known as a Cheater Tin or Short Shaker, is made of high-quality Stainless Steel. The 16oz shaker is traditionally used to cap a 28oz shaker rather than using a mixing glass. Mixing Glass – Whether you use a mixing glass or a short shaker (aka ‘cheater tin’), you’ll need one or the other to create and mix up cocktails. When placed mouth-to-mouth inside the shaker tin, a water-tight seal is formed allowing for the mixing of contents without any spillage. Cocktail Strainer – If you’re gonna make cocktails, you’re gonna need a cocktail strainer. Some shaker tins come with a built-in strainer in the lid but nothing beats the versatility of the standard bar cocktail strainer. Corkscrew / Wine Opener – There are almost as many wine openers on the market as there are bottle openers. Other than the fact that you should get a 2-stage wine opener (like the one shown here), the rest is really a matter of preference. A 2-stage corkscrew allows you to take the cork halfway up, then ‘reload’ with the second stage to pull the cork all the way out. Sometimes, with single stage wine openers, you just can’t seem to get the cork far enough out of the bottle. 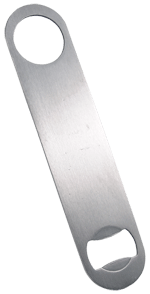 Bottle Opener – One of the most widely used bar tools in a bartenders toolbox. This speed bottle opener is designed to open beer bottles the old-fashioned way or to ‘pop’ them open by pushing down rather than lifting up, using the other end. Pour Check – Free pouring skills need help? The Pour Check is an all-in-one tool that saves time while training your bartenders how to free pour accurately. Have them pour using practice bottles of water and check their accuracy. 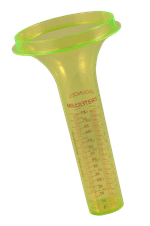 It measures in both US ounces and milliliters. Waste is money; so test your own or your bartender’s free pouring skills with this nifty Pour Check alcohol measuring device. Lemon Peeler / Lime Zester – Whatever you call this little peeling / zesting tool, you’ll enjoy how easy it is to make lemon or lime zests. These little citrus strings are added to drinks such as martinis. It serves to flavor the drink as well as add to the overall look of the finished cocktail. Bar Spoon (with Fork) – The bartender’s buddy, the bar spoon, is a much-needed accessory for any bartender who serves more than just beer. A long spoon for mixing and tasting and a useful little fork on the other end. Muddler – A muddler is used to muddle – or mash up – ingredients to release their oils and flavors. Probably the most commonly-known muddled drink would be the Mojito – a Cuban rum cocktail containing mint leaves (the recipe can be found here). Ice Bucket – Whether you are stocking your home or mobile bar or you work in a bar, you’ll need ice buckets. At the bar, they’re used for champagne and for chilling other bottles. At your home bar or for your mobile bar business, you’ll need it for storing ice for drinks. Cutting Board – As important as having a sharp knife around the bar, its as important to have its counterpart, the cutting board, clean and dry and stored somewhere close by. Almost all bars use fruit to garnish their drinks. And, if they use fruit garnishes, they need to cut that fruit. Never cut on anything other than a clean, dry cutting board. And wash it with salt once in a while to really get in the grooves and kill the bacteria. not as porous, therefore it doesn’t capture as much odor and bacteria. Condiment / Fruit Tray – Every bar serves some type of garnish on their drinks. From standard lemon slices and lime wedges to orange wheels and tropical fruit chunks, these trays are great for anything from fruits, olives and pickles to tea and hot chocolate. 3-Tiered Glass Rimmer – If you serve cocktails, fancy martinis, Caesars or Bloody Marys or any slew of specialty coffees or teas, you’re going to need a rimmer. If you have the room, we suggest just buying two fruit trays, like the ones above – they work better, stay cleaner, are faster to use and overall a lot sturdier. Don’t get us wrong, this will serve its purpose if your bar doesn’t have space or serves a lot of rimmed drinks. The basic problems are trying to open it in a hurry and the cross-contamination of tray contents during opening and closing. Biggie Bar Mat – Every bartender knows that a good bar mat is essential. Essential for making drinks, catching spillage and for draining measuring glasses in between uses. The bigger the mat, the better – and this Biggie Bar mat is wider and longer than your average bar mat. Cocktail Napkins – Cocktail napkins are just classy. And in addition to adding to the final presentation of the drink, they are useful to wipe the bar top after a customer has finished – something coasters just can’t accomplish. If you’re anything other than a sports pub, using cocktail napkins is an easy way to increase the image of your establishment.